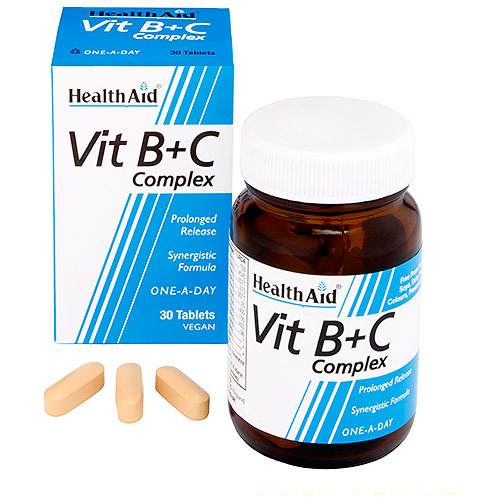 HealthAid Vit B+C Complex Tablets contain B vitamins which play a key role in our metabolism. They are involved in the release of energy and may help the maintenance of healthy nervous system and skin. This unique formulation is a combination of essential water-soluble B vitamins, choline, inositol and PABA along with vitamin C and iron. *Long term intake of this amount of vitamin B6 may lead to a mild tingling and numbness. Bulking Agent (di-calcium phosphate, microcrystalline cellulose), Vitamin C (ascorbic acid), Anti-caking Agent, (vegetarian stearic acid, silica vegetarian magnesium sterate, talc) Thaimin HCI, Riboflavin (Vitamin B2) Niacin (nicotinamide), Vitamin B6 (pyridoxine HCl), Pantothenic Acid (calcium pantothenate), Para Amino Benzoic Acid (PABA), Inositol, Choline Bitartrate, Glazing Agent [hydrocy propyl methyl cellulose (HPMC), titanium dioxide, triacetin, mineral oil], Iron, (ferrous gluconate), Natural Colour (iron oxide), D-Biotin, Folic Acid, Vitamin B12 (cyanocobalamin). Adults and children over 12 years of age, take 2 tablets daily with or after food. Do not exceed recommended daily intake unless advised by a suitably qualified person. Store in a cool dry place our of sight and reach of children. Below are reviews of HealthAid Vit B+C Complex Tablets - 30 Vegan Tablets - Best before date is 30th June 2019 by bodykind customers. If you have tried this product we'd love to hear what you think so please leave a review. 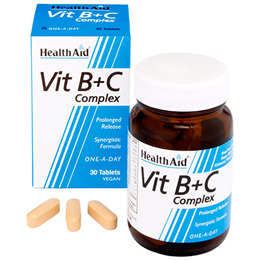 HealthAid Vit B+C Complex Tablets contain B vitamins which play a key role in our metabolism. They may help the maintenance of the nervous system and skin. This is a combination of B vitamins, choline, inositol and PABA along with vitamin C and iron.